After our post yesterday on Bathing Beauty we decided to post another tribute to the lovely Esther Williams. Esther Williams was a sight to see in the water. She starred in a number of aquatic musicals, including Bathing Beauty, Thrill of a Romance, Neptune’s Daughter, and Million Dollar Mermaid. She has starred in many movies in her lifetime but the swimming movies were the ones that garnered her the most following. A business woman at heart, she forged ahead realizing that movies with swimming could only take her so far. She set up endorsements and modeling for swimwear companies. She had high hopes to join the 1940 Olympics but they were cancelled because of the war. After endorsing swimsuits in 1940s and 1950s which we will be writing about tomorrow, she designed her own swimsuit line, the Esther Williams Swimsuit Collection. She also put her name on a line of backyard swimming pools. Both businesses are still thriving today. She's written an autobiography called The Million Dollar Mermaid which is a fascinating look at her life and provides some wonderful behind the scenes stories. In 1966, she was inducted into the International Swimming Hall of Fame and in 1997 she received the Lifetime Achievement award from the Academy of Motion Picture Arts and Sciences, the Academy Foundation, and the Museum of Modern Art. Esther is still alive and kicking! Born on 8/8/1921, she's got a birthday coming up this Saturday. A fabulous interview was recently conducted with Esther Williams by Diane Sawyer and can been seen here. Thank you Esther for your determination, drive and pioneering spirit in the area of swimwear and swimming. You're truly an inspiration to me. What I wouldn't give to see your swimwear costume archives, they must be amazing!! 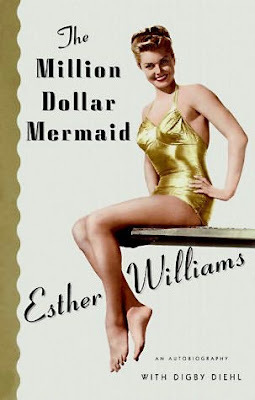 I'm digging the Esther Williams posts and looking forward to more. I've been meaning to see her films ever since I fell in love with synchronized swimming during last year's Olympics. BTW, there is another swimming pioneer whose films I am dying to see: Annette Kellerman!